Don’t miss out on this unique marketing opportunity for your business while helping to bring more transportation funding to Southern California. Check out the Mobility 21 website to see a list of sponsors already signed up to support this year’s Summit. Will your business be left behind? View the sponsorship packages. STUDENTS: Want to participate on a panel at Mobility 21’s Summit? Submit a one page essay or a one minute YouTube video on “Transportation Next: What the Transportation System of Tomorrow Should Look Like” and you may be chosen to lead a panel discussion on transportation innovations. The winner will receive a complimentary ticket to the Summit and an invitation to the exclusive VIP reception hosted by Mobility 21’s Board of Directors. PARENTS: Do you have kids that are born to be stars? Submit a short YouTube video featuring your child answering the question, “What I think transportation is” and we may include your clip in a video played during the Summit. HOW TO SUBMIT YOUR ENTRY: E-mail essays and / or the link to your uploaded YouTube video to Kristin Slocum at kslocum@mobility21.com. 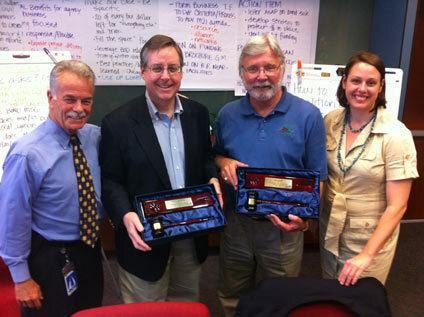 OCTA CEO and Mobility 21 Chairman Will Kempton presents gavels to former Mobility 21 chairmen Steve Finnegan of the Automobile Club of Southern California and LA Metro CEO Art Leahy with Mobility 21 Executive Director Marnie O’Brien Primmer. Mobility 21’s board of directors and advisory members met Friday at the Orange County Transportation Authority’s (OCTA) offices to discuss the future direction of the Coalition. Among the topics discussed were advocacy efforts related to the passage of the next federal surface transportation bill and the California state budget, as well as a national policy for freight movement and several operational issues. In a brief ceremony, Kempton presented ceremonial gavels to past chairmen Steven Finnegan of the Automobile Club of Southern California and Art Leahy, Los Angeles County Metropolitan Transportation Authority CEO. “Through the leadership shown by our past chairmen, this coalition has grown and become a formidable force in Washington and Sacramento,” Kempton said in his presentation. 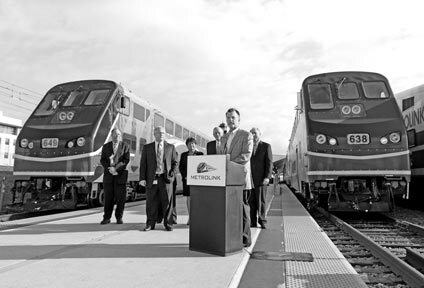 During a press conference, Metrolink officials announce the addition of new trains and expanded service to keep up with the region’s transportation needs. Earlier this month Metrolink added 16 new trains to its system, providing more affordable transportation options as gas prices near record levels. Of the new trains, four are part of an express service pilot program that can save commuters up to an hour every day by limiting the number of stops. “Metrolink trains offer a convenient alternative to driving. Our new service expansion provides Southern Californians even more options to save time and money by taking public transportation,” said Metrolink Board Chairman Richard Katz at the press conference at Los Angeles Union Station. In addition to adding 16 new trains, Metrolink is expanding the routes of two early-morning trains to Burbank’s Bob Hope airport to provide travelers an opportunity to take the train to their plane. 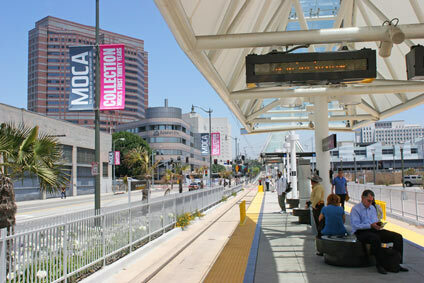 Metrolink also adjusted the schedules of Orange County and San Bernardino line trains to connect with early morning trains to the airport. “We want to get our passengers to their destination quicker than driving and more affordably. As gas prices continue to increase and transportation funding remains scarce, Metrolink is looking to play a bigger role in meeting the region’s transportation needs by providing service that competes with the car,” said Metrolink CEO John Fenton. This expansion is particularly remarkable as most transportation providers are trimming back service. The cost of new service is being offset by operational savings and an anticipated increase in fare revenue as a result of increased ridership. 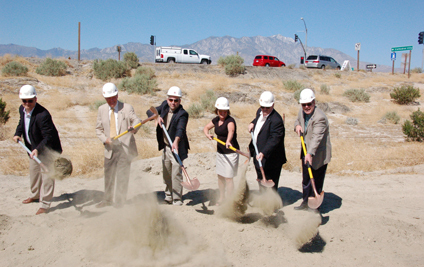 Officials “break ground” during a ceremony for the I‑10 / Date Palm Drive Interchange Projects. Reducing delays and eliminating congestion moved one step closer as construction crews recently broke ground on the new I‑10 / Date Palm Drive interchange in Cathedral City. The project is the fourth interchange to start construction on the I‑10 in the Coachella Valley since 2010. 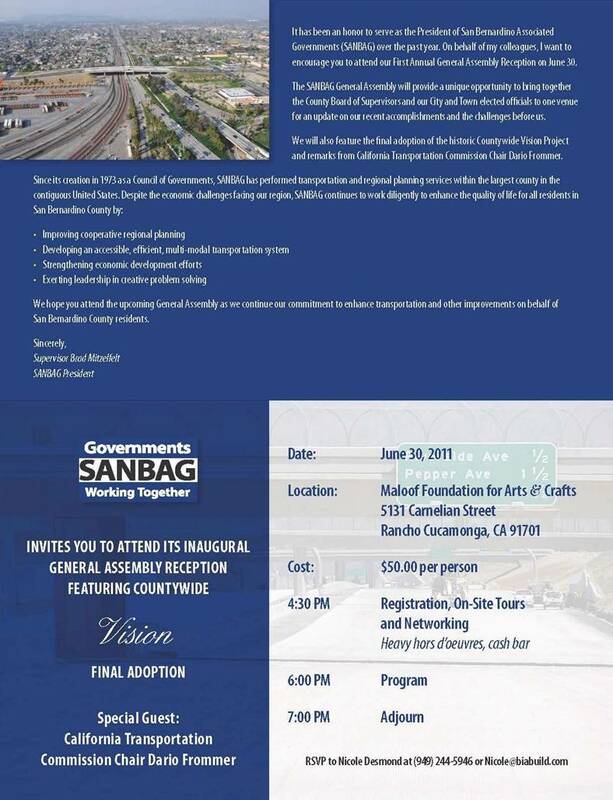 Two additional projects, the Monterey Avenue interchange is expected to begin construction in the spring of 2012 and the Jefferson Avenue interchange project is slated to start in late 2014 or early 2015. U.S. 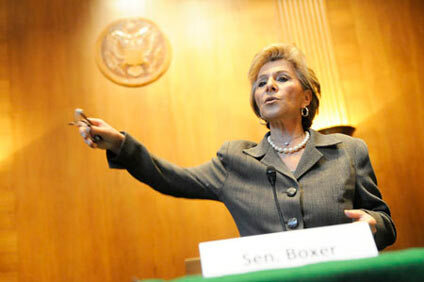 Senator Barbara Boxer meets with the Los Angeles Area Chamber of Commerce delegation to discuss transportation reauthorization and America Fast Forward. As part of the Los Angeles Chamber of Commerce’s annual ACCESS D.C. legislative trip earlier this month, more than 150 business, civic and labor leaders gathered in Washingon, D.C., to advocate for job creation and to ensure that Los Angeles continues to be a driver in the nation’s economic recovery. The economy and infrastructure were among the group’s top priorities this year, with an emphasis on passing a federal transportation reauthorization and the support of the America Fast Forward program. Members of Congress from both parties expressed support for the expansion of the Transportation Infrastructure Finance and Innovation Act (TIFIA). Elected officials and committee staff committed to engage with the Chamber once transportation reauthorization language is released. “L.A. 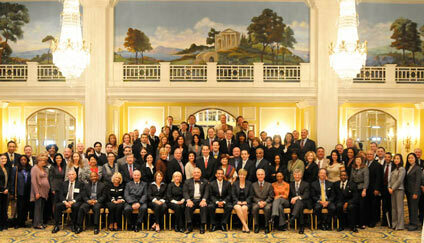 should be proud,” said Sen. Barbara Boxer (D-CA) discussing Los Angeles’ leading role in TIFIA funding. The delegation was briefed by U.S. Secretary of Transportation Secretary Ray LaHood and Federal Transportation Administrator Peter Rogoff. The delegation included Chamber Board Chair Joseph Czyzyk, Mercury Air Group; L.A. Mayor Antonio Villaraigosa; Glendale Mayor Laura Friedman; L.A. City Controller Wendy Greuel; L.A. City Councilmember Paul Krekorian; Los Angeles Unified School District President Mónica García, Superintendent John Deasy and Board Member Steve Zimmer. L.A. County Supervisors Zev Yaroslavsky, Mark Ridley-Thomas, Don Knabe and Michael Antonovich participated in several of the meetings. PB is a proud supporter of Mobility 21 and creating strategic partnerships for a connected future. The Mobility 21 effort involving coalition building, public-private collaboration and a single focus messaging – advocating to improve transportation services, projects and programs in Southern California – resonates and complements the goals of Parsons Brinckerhoff (PB) as a global business and a community presence. For the past four years PB has supported the Mobility 21 Conference and efforts and we look forward to an ongoing association in the future. PB has a deserved reputation as an engineering firm that is client-focused. Throughout the life of a project, PB is a partner in problem-solving, internal and public communicating, strategizing, and on-time/on-budget project delivery. This ethic permeates the PB community world-wide and has served it well throughout the last 125 years of the firm’s history. The Southern California offices of PB live this ethic by working in partnership with our clients and the industry to deliver transportation projects that improve mobility, ‘green’ the environment and prudently expend public funds. 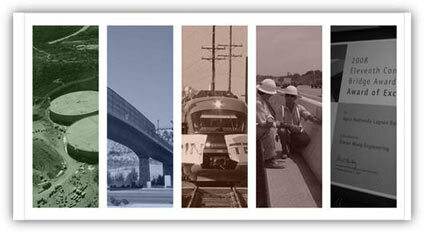 For 40 years, PB has been the go-to transportation engineering firm for our public and private partners in Southern California, most especially in the development of the area’s rail program and the highway and arterial needs of the region. Those ongoing relationships with policy makers and staff, small businesses and the communities in which we live and work are strong and positive. PB works toward developing a client relationship model that builds on and extends beyond ‘the project.’ PB was instrumental in its support and effort toward the successful passage of Measure R, the third ½ cent transportation sales tax measure in Los Angeles County and other essential transportation sales tax measures throughout the Southland. These locally raised funds provide a unique opportunity in the US for a regional transportation agency to proceed with their program during a global economic downturn and financially challenging times at the state level. PB has provided advice and counsel to our public clients on how best to implement the sales tax measure programs and also advised on how best to utilize staff talent and leverage federal funding with an approach that is innovative and creative. The client advisor role is a step beyond the project level and involves a comprehensive strategy designed to benefit the community, the client, and the industry as whole, not just PB. Established in 1986, Simon Wong Engineering (SWE) has strategically grown and diversified to become an industry leader in Southern California. Headquartered in San Diego, with offices serving Irvine, Los Angeles, Riverside, and San Francisco, SWE is comprised of four divisions: Public Relations, Bridge Design, Structural Design, and Construction Management and Inspection. Throughout its 25 years in business, SWE has played a major role on some of the regions’ most innovative and high-profile roadway and transportation projects. SWE believes that people want to do business with companies they know and trust. SWE’s mission is to be essential partners to our clients by building and managing strong, trust-based relationships with the people critical to their success. This is why the firm has a proven track-record of successfully managing major public outreach, construction management, and design-related contracts. 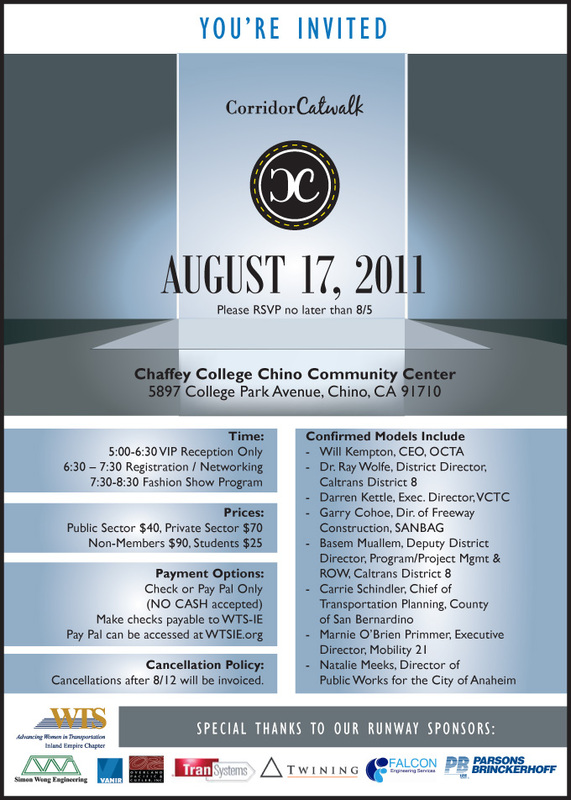 This success has resulted in numerous repeat clients including North County Transit District, SANDAG, SANBAG, Caltrans Districts 8, 11, and 59, the City of Los Angeles, County of San Diego, Orange County Transportation Authority, Riverside County Transportation Department, Centre City Development Corporation, Southeastern Development Corporation, the City of Carlsbad and many others. We have worked hard to develop these relationships and earn a great amount of respect from our clients. Simon Wong Engineering is a loyal supporter of Mobility 21 for their unwavering dedication in bringing together Southern California to create one voice that conveys the region’s transportation needs to those in Sacramento and Washington, D.C.
Akerfa co-founders Dustin McBride and Vaughn Spethmann gave an inspiring presentation during the 2010 Mobility 21 Summit on the transformative power of transportation. This photograph features a bicycle ambulance. At Akerfa, we are aiming to turn the developing world around one bike at a time, and it truly seems to be happening. 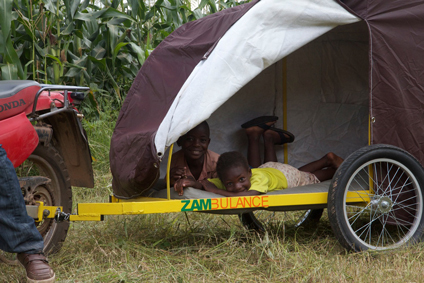 In Zambia, we have fabricated and distributed over 200 Zambulances (bicycle ambulances). Our goal for 2011 is 1,000, but it is a great start. The Zambulances we have sent in the field have had a huge impact already. Check out this short video to see for yourself. Our container of bikes is currently clearing customs in Kenya. It will be exciting to start the venture there, too. Maybe the most exciting recent development is our joint venture in Los Angeles. We are venturing with a vocational skills training school based in skid row and are hoping they can help us build bicycle ambulances to send to Uganda, Congo and all over Africa and South America. It will be great to empower those around us in the U.S. while at the same time helping hundreds of people abroad. Stay in touch at akerfa.org to sponsor a bicycle ambulance for a rural health clinic or check out zambikes.com to get your bamboo bicycle today. Webinar: Cargo and Jobs – Still Ours to Lose?